No, not together in the same filling. I am sharing two different takes on my favorite cookie. 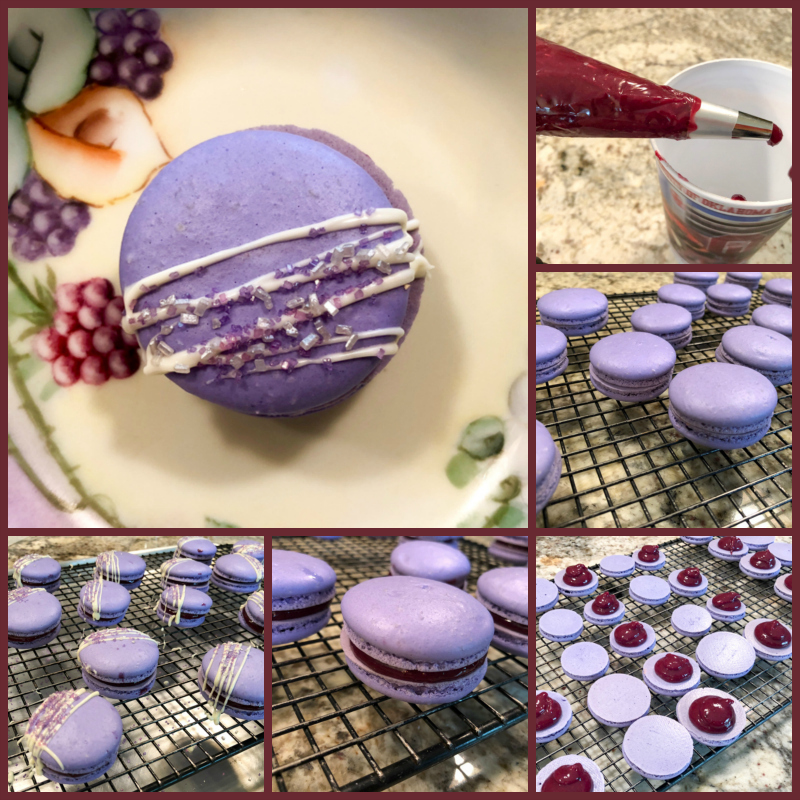 Curd can be a tricky filling for macarons because anything with moisture is a killer, so normally a buttercream or ganache-based preparation is the best option. But, if you intend to consume them within a day, maximum two, give curd a try. It has the best sharp, acidic flavor to stand against the sweetness of the shells. Since every batch I bake is shared with our departmental colleagues and more often than not they are inhaled within 3 hours of arrival… I never have to worry too much about the issue. 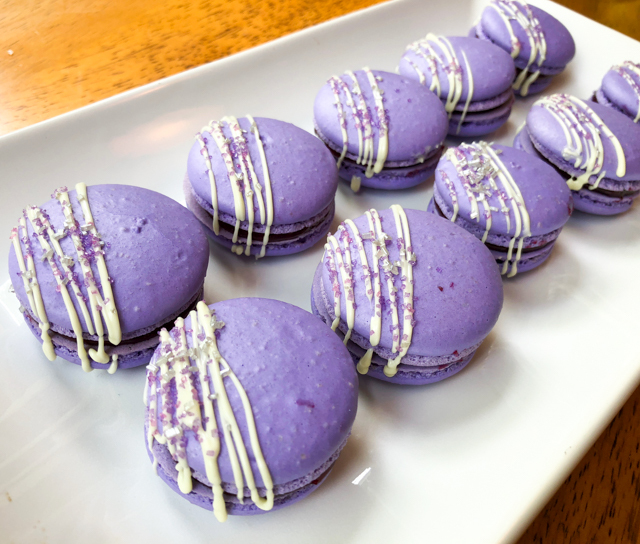 The blueberry version is a pure curd, the mango was “tamed” with a bit of white chocolate ganache. They were both delicious, but I must say I haven’t quite hit the mango flavor with the intensity I want. I need more cowbell on that (Saturday Night Live lovers, anyone?). Blueberry Macs first, scroll down for the Mango version. Make the shells and bake them as described in the link. Make the filling: Place the blueberries and lime zest in a saucepan with 1 tablespoon water and cook gently, mixing occasionally until soft, 8 to 10 minutes. Pass the mixture through a fine sieve, and place inside a glass bowl that will fit over a saucepan with a small amount of simmering water. Add the butter and sugar and cook until the sugar is fully dissolved and the butter is melted. Add the eggs and continue to stir over gently simmering water until the curd thickens enough to coat the back of the spoon, and reach about 170 F. The process can take a while, but I like to start it on the stove and if the temperature gets stuck in a certain level, I place the bowl in the microwave and give it a couple of 20 second bursts to make sure it is heated to 170 F. It is imperative to use a thermometer, so that you don’t risk going over the temperature goal. You can always just baby-sit the curd on the stove full-time. Once it’s done, strain the curd, and let it cool completely before using it to fill the macaron shells. 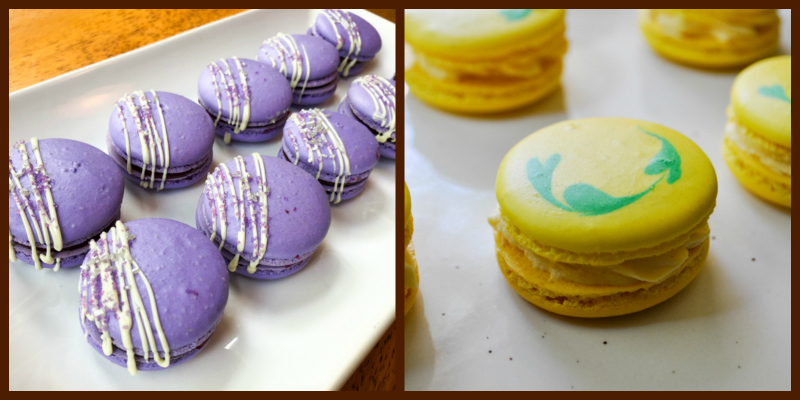 Macarons are best enjoyed after 24 hours in the fridge. Comments: I cannot believe how beautiful the blueberry curd turned out. What amazing color! If you like tart-and-sweet stuff, you’ll fall in love with it. When I make the shells I always marry them to get as closely in size as possible (my piping is never too consistent, I’m afraid), then I open them side by side and add the filling to one of the partners. The decoration was very simple, a drizzle of candy melts white. Yes, I took a shortcut instead of tempering white chocolate, because when I made these, I was having quite a few issues with tempering chocolate. Since the drizzle is a minor component of the cookie, I decided that in the name of my mental sanity, I would use it. A sprinkle of decorating purple and pink sugar crystals closed the deal. 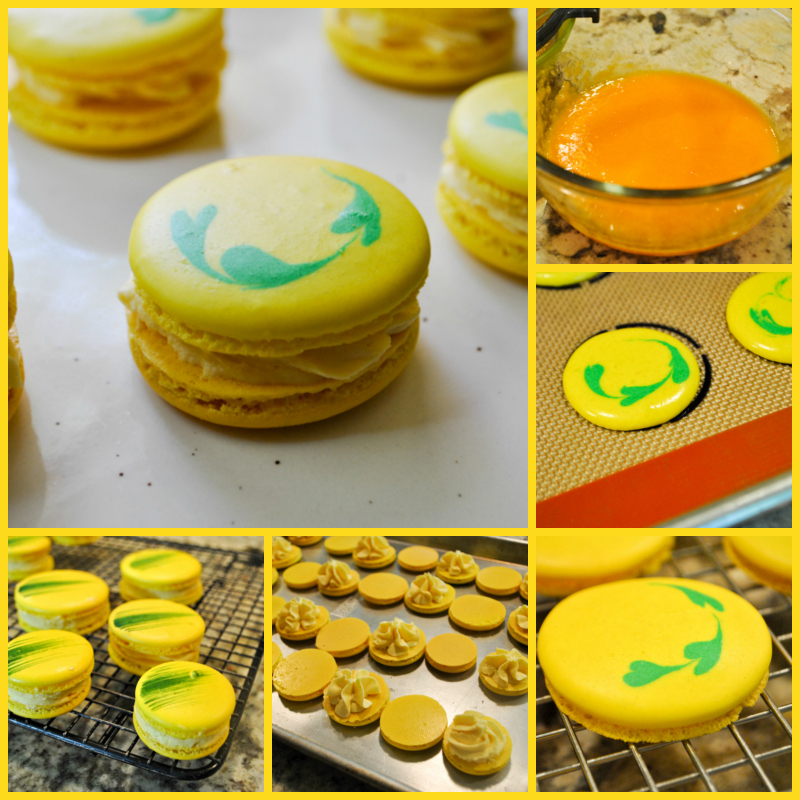 It is hard for me to pick a favorite macaron, but this version was very very tasty. Separate a small amount of batter ( about 1/3 cup) and add green food color to it. Add yellow color to the rest of the batter. To decorate the shells with the heart-shaped swirls, place the small amount of green macaron batter inside a piping bag. No need to use a tip, you can cut a small opening so that it will release small drops. Pipe the shells with the batter tinted yellow. Right after piping, drop three dots of green batter on the edge of the shells, and run a line through them with a toothpick or a metal gadget for cookie design. Let the shells dry to form a skin and bake as you would normally do (see the link included). Make the filling: Whisk the mango pulp, sugar, lemon juice, cornstarch and salt in a bowl. Whisk in the egg yolks. Place in a double boiler with water simmering underneath. Cook stirring gently until thickened, it should take only about 5 minutes due to the cornstarch. Remove from the heat and whisk in the butter a few pieces at a time until incorporated. Strain the mixture through a fine-mesh sieve into a small bowl, pushing it through with a rubber spatula. Press plastic wrap directly onto the surface to prevent a skin from forming. Refrigerate until completely set, at least 4 hours. Make a white chocolate ganache by placing the chocolate in a bowl and pouring over it the heavy cream heated to almost boiling (bubbles forming at the edges of the pan). Let it sit for a few minutes, swirl gently to dissolve the chocolate, add the butter and mix. Let it cool to room temperature, then add to it 1/3 of a cup of the mango curd. Mix well and refrigerate for several hours before filling the shells. If desired, you can whip the mixture before doing so. 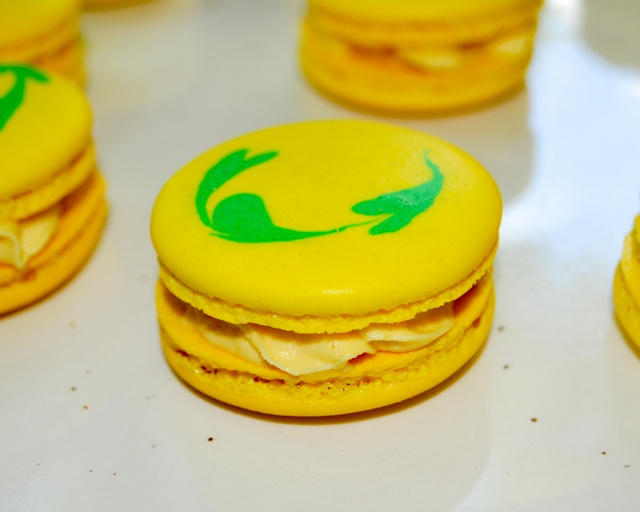 Comments: You will notice that I had two different types of decoration in these macarons. The problem is that you need to work very fast to pipe the green batter into the shells and do the swirl. Ideally, this should be a two-persons job. Since I was doing it by myself, I quickly realized I would not be able to decorate them all before mixing one color in the other would become problematic. 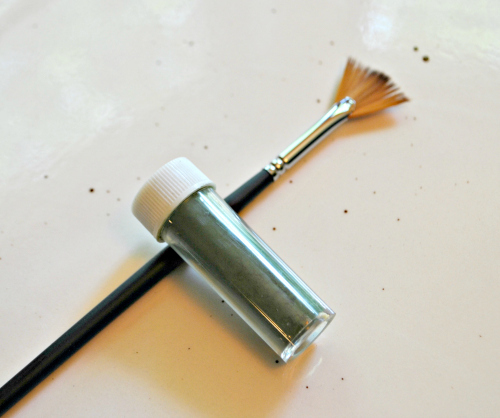 So, I adapted a Plan B, and used pearl dust in dark green, a little Everclear to dissolve it, and a brush with wide open bristles. 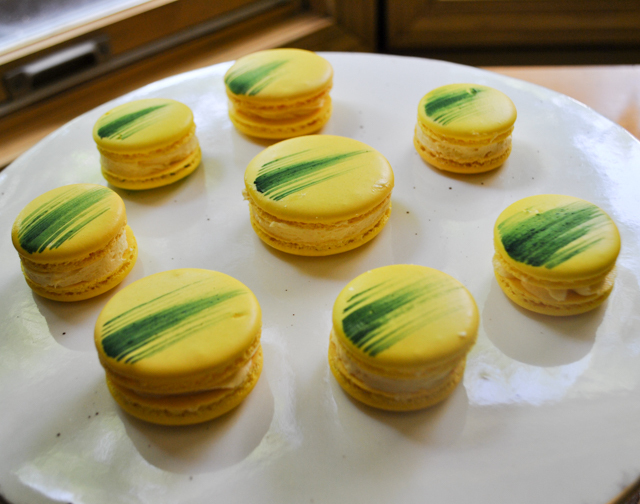 The color must be dissolved in alcohol (some say lemon juice works too), but no worries if you serve the macarons to kids, the alcohol quickly evaporates without affecting the delicate shells. Each shell, once baked and cold, gets a quick stroke of the brush dipped in the alcohol-dust mixture. No need to measure anything, the alcohol is there just to provide moisture. The more pearl dust, the darker the resulting color. Very easy and straightforward. As to the flavor, both Phil and I felt that the mango flavor did not come through as much as we would like. I have some ideas for next time, while mangos are still around in the grocery store. If you have suggestions, please leave a comment and I’ll be very grateful. I wonder if a pure mango curd would have worked better. SEVEN YEARS AGO: Headed to Brazil!